The biggest problem with termite infestation is that, the termites can reproduce at a very rapid rate with the queen laying hundreds of eggs daily. So the faster you are able to get rid of termites in furniture at home, the better for you. Because, that’s the only way to save your furniture and home from becoming the breeding grounds for termites. To make things easier for you and to help you get rid of termites in furniture, I am sharing a few of the best and most effective tips to get rid of termites naturally and easily from your home. If you follow these natural termite removal tips and remedies, you will be able to keep your home termite free easily and for long. There are some shortcut ways of getting rid of termites with the store bought chemicals being the easiest available option. Well, I do not doubt their efficiency at killing the termites, but what I am actually concerned about is the harmful effects that these repellants can have on your health and associated costs. After all, the commercial termite killing products are nothing but chemicals, exposure to which can lead to several health concerns like breathing troubles, allergies, irritations and may even have long term serious consequences. And when you can get rid of termites in furniture using natural remedies and ingredients, there is no point in not using these remedies over the chemicals. So, it makes sense to avoid these chemicals and try out the remedies I am sharing below to get rid of termites fast and naturally from your home. Trust me, termites may be very disgusting, but driving them away from your home is not that difficult. The problem of termites is quite a common one, so let me not diverge any further and start straight with how to get rid of termites at your home. How to get rid of termites in furniture at home naturally? The good thing is no matter which type of termites has infested your home, the basic ways to drive them away from your home are all the same, so if you take note of my below-mentioned natural ways, you will surely be able to get rid of termites fast and naturally. Termites are not able to withstand hot sunlight and you need to take advantage of their weakness and expose them to the strong sunlight. If you have noticed termite activities in any of the furniture, then try to expose that specific furniture to the sunlight. And, if you have already located the hive of the termites, then remove all of the clutter from around it and allow the place to receive sunlight. You may also dig in and around the hive in order to expose the colony to the heat and the harsh rays of the sun. Moreover, if they have already started feeding on any of your wooden furniture, make sure you keep it outdoors in the heat of the sun for some days. Well, it is true that sunlight alone cannot destroy the full termite population, but it can surely reduce their numbers to a great extent. 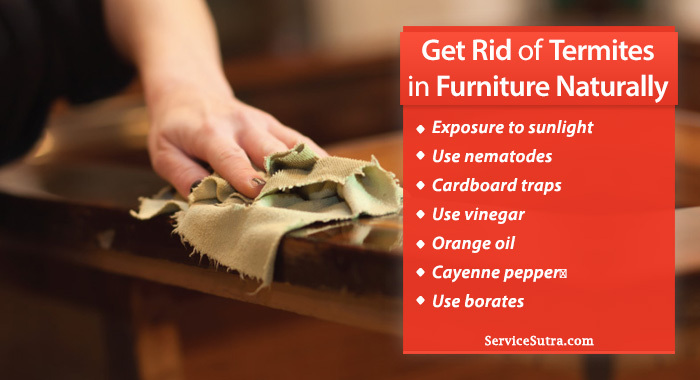 One of the best ways to get rid of termites in furniture at home is by taking the help of the beneficial nematodes. I know most of you may not be aware of it but nematodes are nothing but small microscopic worms that can easily destroy an enormous termite population. How? Well, once they are introduced to the termite colony, these worms release bacteria that prove to be very deadly for the termites and they die soon after. The beneficial nematodes are found in the local stores. You just have to purchase them and release them into the hive of the termites and the rest of the work will be done by the nematodes. This is one of the best natural ways and you can definitely consider using it to get rid of the termites in furniture at your home. If you are not much confident about using the microscopic worms, then you can go for the other natural way which is the cardboard trap. See, we all know that the termites love to feed on cellulose and cardboard being full of cellulose will definitely serve as a good trap for them. So, using cardboard traps are undoubtedly the best ways to get rid of termites in furniture from your home. You just have to arrange for a large and moist cardboard and role it into a tube shape. Now, place these traps in areas where you have already found the symptoms of termite infestation. After few days, collect the traps and throw it at a place that is far away from your home. You may even treat the termites using a natural insecticide if you want to. The all-purpose white vinegar can serve your purpose of killing the termites as well. Most importantly, it is easily available in most households, so the moment you find the sign of termite infestation, you can immediately use it on them to kill them fast and easily. Using vinegar to remove termites is easy. Just have to mix half cup of white vinegar with freshly squeezed out lemon juice. Then you just have to pour the solution in a spray bottle and spray it on the termite infested spots. Keep repeating this remedy until all of the termites die or run away. If your home is infested by the drywood termites (also in case of other types of termites), then do not think too much and use the orange oil remedy to get rid of them as early as possible. This is because orange oil is made mostly of d-limonene, which is actually a solvent very much deadly for the termites. So, when the termites are directly exposed to the orange oil, their exoskeleton begins to dissolve, leading to the loss of proteins and moisture from them and ultimately lead to their death. You just have to spray orange oil in the hives of the termites or in the corners or places in your home where you have located termite activities. Orange oil also disrupts the pheromones of the termites which they use to communicate. So, the orange oil method may be used as a detergent as well as the termites will never come near any space which is saturated with the orange oil. However, please be a little careful while using orange oil and take the necessary protection as well. This is because orange oil may lead to irritation in the skin and also lead to several complications if ingested. The next option that you have in hand is to use the cayenne pepper to kill the termites inside the furniture at your home. You can simply sprinkle them in the infested areas or may even mix it with some light vegetable oil and apply the mixture on the vertical spots. Continue using this hack until the termites disappear fully. Sodium borate is one of the effective ways to get rid of the termites and if you want you can use this option to solve the problem of termites from your home. The reason why borates are so effective is because they affect the nervous system of the termites and then dehydrate them to death. There are two options to use borates. Firstly, you may cover the infested area with borax powder for about a week which will in all probability, kill the termites. And Secondly, you may mix borax powder in hot water and then spray it in the wooden furniture or if possible, inside the termite hives as well to kill the termites. How to prevent termite infestation in furniture at home? Till now, I have talked on some very effective ways to get rid of termites in furniture from your home. In other words, these are the tricks you can use once your home has been infested with the termites, but isn’t prevention better than cure? Well, it surely is, so, why don’t you stop the entry of the termites inside your home at the first place. Then things will be much easy for you. Here are some ways you can consider in order to prevent the termites from infesting your home. In order to prevent huge termite infestation in your home, you need to do close inspection of your home frequently. I mean, if you are able to detect them in the early stages, then you can get rid of them at the first place and prevent them from breeding in huge numbers inside your home and then spreading to other portions of your home. Most of the pests love wet and damp temperature and the termites are no exception. They also love to thrive in places where there is a lot of moisture. So, the thing that you will have to keep in mind is to keep your home as dry and airy as possible. Make it a point to switch on your ac or your fans time to time so that any moisture if there gets dried quickly. Also, on sunny days, keep your windows open and let the fresh air and outside heat enter and keep the inner space dry. In addition, keep a close eye that there are no water leakages inside or around your home which is coming in contact with the foundation of your building as that will lead to your home becoming very damp which in turn make it an easy target for the termites. One of the best ways to prevent termites inside your home will be by making the woods inside your home unappetizing for them. Confused? Well, I am talking about wood treatments that lead to the removal of the moisture from them. This approach will not just make them unfavorable for the termites to eat them or destroy them but also will make them more durable, structurally stable and resistant to rot. So, you must give it a serious thought. The more the wooden debris around your home, the more will be the chances of termites being there. And slowly they might even find an entry route inside your home. So, to avoid that from happening, make it a point to remove tree stumps, branches, and other wooden debris from around your home. Also, please avoid storing firewood or any other lumber around or even near your home. In addition, please keep the small trees, shrubs, and the bushes properly maintained so that the branches of the trees in your yard do not act as the route of entry for the termites. Even the dead plant remains must be removed. While you are inspecting your home, if you find any cracks or holes that might act as the entry point for the termites to come inside your home, please make sure to seal and fill all the entry points. Special attention must be given to utility lines and pipelines. All the exterior vents must have screens that are good enough to prevent termite entry. The problem of termites in furniture in your home is quite common. Luckily there are easy and natural ways to deal with the termites. I have already shared a few of the best ways to get rid of termites from the furniture in your home. I am sure these tricks are going to help you making your home termite free easily and naturally. But as you know, prevention is better than cure and so I have also mentioned a few ways to prevent termite infestations in your home. Please take proper note and try these home improvement hacks to avoid termite infestation at the first place. That’s all the advice I had to share and I hope these tips will help you to get rid of termites from your home. If you know any other natural trick and remedies that can be effective in dealing with termites at home, then do share by commenting below. Also, I encourage you to share any suggestions and feedbacks in the comments section. I will be eager to know what you felt after reading my today’s post. And, if you like my post, please like, comment and share it with others and help me reach out to as many people as possible.